Forest Hills, NY: Forest Hills Publishing Co, 1932. Early edition. Hardcover. fair to good. 305 pages. Bibliography, board corners and top and bottom spine edges worn/small chips, small piece missing at top of spine. Dale Harbison Carnegie (November 24, 1888 - November 1, 1955) was an American writer and lecturer and the developer of famous courses in self-improvement, salesmanship, corporate training, public speaking, and interpersonal skills. He was the author of How to Win Friends and Influence People (1936), a bestseller that remains popular today. He also wrote How to Stop Worrying and Start Living (1948), Lincoln the Unknown (1932), and several other books. One of the core ideas in his books is that it is possible to change other people's behavior by changing one's behavior toward them. Carnegie changed the spelling of his last name from "Carnagey" to Carnegie, at a time when Andrew Carnegie (unrelated) was a widely revered and recognized name. As Dale Carnagey he worked as assistant to Lowell Thomas in his famous travelogue "With Allenby in Palestine and Lawrence in Arabia". He managed and delivered the travelogue in Canada. By 1916 Dale was able to rent Carnegie Hall itself for a lecture to a packed house. Carnegie's first collection of his writings was Public Speaking: a Practical Course for Business Men (1926), later entitled Public Speaking and Influencing Men in Business (1932). His crowning achievement, however, was when Simon & Schuster published How to Win Friends and Influence People. Carnegie died at his home in Forest Hills, New York, where this early edition was published. Bookplate signed by Dale Carnegie awarding this book to a student in class number 16 as a prize for his excellent talk on "How to Win Friends and Influence People." Lincoln the Unknown is a biography of Abraham Lincoln, written in 1932 by Dale Carnegie. It is published by Dale Carnegie and Associates, and given out as a prize in the Dale Carnegie Course. Abraham Lincoln, a farm boy, becomes the president of The United States. He travels miles to borrow books; reading being the dominant passion of his for quarter of a century. He mourns the loss of his first love his whole life. He humors his colleagues in the White House, and lives with the difficulties of the marriage with his second love, while in war with the South. One spring day, Dale Carnegie was breakfasting at a hotel in London. He came across a column in the Morning Post newspaper entitled "Men and Memories". On that particular morning and for several mornings following, that column was devoted to Abraham Lincoln-the personal side of his career. Carnegie read those with profound interest, and surprise. He had always been interested in the United States history. Aroused by the articles in the Morning Post, Carnegie went over to the British Museum Library and read a number of Lincoln books; the more he read, the more fascinated he became. Finally he determined to write a book on Lincoln, himself. Carnegie began the work in Europe, and labored over it for a year there, and then for two years in New York. Finally he tore up all that he had written and tossed it into a waste-basket. He then went to Illinois, to write of Lincoln on the very ground where Lincoln himself had dreamed and toiled. For months he lived among people whose fathers had helped Lincoln survey land, build fences and drive hogs to market. For months he delved among old books, letters, speeches, half-forgotten newspapers and musty court records, trying to understand Lincoln. Carnegie spent one summer in the little town of Petersburg. He went there because it is only a mile away from the restored village of New Salem, where Lincoln spent the happiest and most formative years of his life. The same white oaks under which Lincoln studied, wrestled and made love were still standing. Every morning Carnegie used to take his typewriter and motor up there from Petersburg, and wrote half of the chapters of his book under those trees. He often used to go alone to the woods along the banks of the Sangamon, on summer nights, realizing that on such nights Lincoln and Ann Rutledge, his first love, had walked over this same ground. When Carnegie came to writing the chapter dealing with the death of Rutledge, he drove over the country roads to the quiet, secluded spot where she lies buried. It was abandoned and overgrown, so to get near her grave, he had to mow down weeds, brush and vines. Carnegie also wrote many of the chapters in Springfield. Some in the sitting-room of the old home where Lincoln lived, some at the desk where he composed his first inaugural address, and others above the spot where he came to court and quarrel with Mary Todd. Dixon Ryan Fox, Professor of History in Columbia University, says: "A fascinating book, as dramatic as a Sabatini novel. It is just in portraiture and wise in emphasis. It is the most vivid volume I have read on Lincoln's whole life." Lowell Thomas says: "The most amazing story in American history. It is a Lincoln book that perhaps could not have been written until today-and a book that no man can read without profit. I know of no other short work on Lincoln which presents so much of him and presents it so unforgettably." Homer Croy says: "It's a wonder! I've always been a Lincoln bug and have read many volumes on him. This comes nearer to making Abraham Lincoln a living, breathing human being than any book that I have ever read. This book takes Lincoln out of the sky, moves him into the house next door and makes a neighbor of him. He's as human as a pair of overalls flapping on the clothes-lines." New York: Perma Giants, 1949. Later edition from an additional publisher. Hardcover. Good. , x, 305,  pages. Bibliography, board corners and top and bottom spine edges worn/small chips, small piece missing at spine. Comments and underling noted. Some pencil erasures noted. Nice inscription signed by Carnegie on fep. Dale Harbison Carnegie (November 24, 1888 - November 1, 1955) was an American writer and lecturer and the developer of famous courses in self-improvement, salesmanship, public speaking, and interpersonal skills. He was the author of How to Win Friends and Influence People (1936), a bestseller that remains popular today. He also wrote, Lincoln the Unknown (1932), and several other books. One of the core ideas is that it is possible to change other people's behavior by changing one's behavior toward them. By 1916 Dale was able to rent Carnegie Hall itself for a lecture to a packed house. Carnegie's first collection of his writings was Public Speaking: a Practical Course for Business Men (1926), later entitled Public Speaking and Influencing Men in Business (1932). His crowning achievement, however, was when Simon & Schuster published How to Win Friends and Influence People. 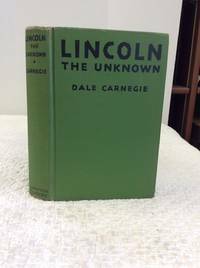 Lincoln the Unknown is a biography of Abraham Lincoln, written in 1932 by Dale Carnegie and given out as a prize in the Dale Carnegie Course. One spring day, Dale Carnegie came across a column in the Morning Post newspaper entitled "Men and Memories". On that particular morning and for several mornings following, that column was devoted to Abraham Lincoln-the personal side of his career. Carnegie read those with profound interest, and surprise. He determined to write a book on Lincoln, himself. Carnegie began the work in Europe, and then went to Illinois, to write of Lincoln on the very ground where Lincoln himself had dreamed and toiled. He delved among old books, letters, speeches, newspapers and court records, trying to understand Lincoln. Carnegie wrote many of the chapters in Springfield. Some in the sitting-room of the old home where Lincoln lived, some at the desk where he composed his first inaugural address, and others where he came to court Mary Todd. 1993-06-07. New. Ships with Tracking Number! INTERNATIONAL WORLDWIDE Shipping available. Buy with confidence, excellent customer service! New York: D. Appleton-Century, 1936 305 pages. SIGNED with a long inscription in green ink by Dale Carnegie: "This book has been / awarded by secret ballot / and popular vote to / George W. Patterson / as first prize / for the best talk on / How to Win Friends / and Influence People / Class # 341 / Congratulations, George / Dale Carnegie.". Illus. by Illustrated. 8vo. Signed by Author. Early Edition. Green Cloth. Very Good. Forest Hills, NY: Forest Hills Publishing Company, 1932. Hardcover. Small 8vo. Light green cloth with dark green lettering, pictorial dust jacket. x, 305pp. Near fine/very good. Mild jacket edgewear. A tight and attractive reprint edition (missed by Monaghan), bearing the often-found bookplate on front flyleaf signed boldly in ink by Carnegie and bearing a printed "Award" statement noting "This book has been awarded by popular vote of Class Number [blank] to [blank] as a prize for an excellent talk on 'How to Win Friends and Influence People.' Congratulations!" Motivational speaker/guru/author Carnegie (1888-1955) is, of course, best known for "How to Win Friends and Influence People" (1936), which has sold more than five million copies. Lovely copy, lovely d.j. Forest Hills Publishing Company. Very Good+. 1932. Hardcover. Hardcover. 1932. Forest Hills Publishing Company. 305 pages. SIGNED as an award by Dale Carnegie on front free endpaper. Very Good Plus condition. ; 8vo 8" - 9" tall; 305 pages; Signed by Author . 1974-06-24. Good. Ships with Tracking Number! INTERNATIONAL WORLDWIDE Shipping available. May not contain Access Codes or Supplements. May be ex-library. Shipping & Handling by region. Buy with confidence, excellent customer service! D. Appleton-Century Co. Used - Good. Shows some signs of wear, and may have some markings on the inside. Dale Carnegie & Associates, Inc., 1959. 256 yellowing pages, green paper with black ltrs on spine, corners and head-heel of spine are bumped, tight. DJ is brown with white & silver ltrs and pencil drawing of Lincoln while the edges and corners are nicked and covers are scruffed. Presentastion plate on ffep for the book being "presented by a vote of Dale Carnegie Class No. 133 to Esther McRae by the president of the Dale Carnegie & Associates, Inc. for a memorable talk setting a personally significant goal." Contains about two to three dozen signatures of other participants in the class.. Unknown Edition. Hardcover. G++/G++. 8vo - over 7¾" - 9¾" tall. New York: Appleton Century, 1943. Book. Good. Hardcover. Inscribed by Author(s). 8vo - over 7¾ - 9¾" tall. Inscribed to Caroline Koger by Dale Carnegie directly on the FFEP in pen. Copyright 1932. Spine and corners faded. Binding tight and square. Pages clean and free of writing or marks. Pictures on request. "My dear Caroline Koger / As Abe Lincoln / used to say:- / may you pluck / a thistle and / plant a flower / wherever you feel / a flower will grow / Dale Carnegie". Forest Hills, 1932. Book. Very Good. Hardcover. Signed by Author(s). In green cloth. Award bookplate signed by Carnegie on front end paper. Wear to cloth at top of rear board. No additional printings listed. Previous owner name to front paste down..
Lightyear Pr, 1993-06-01. Hardcover. Used:Good. Forest Hills Publishing Co., 1932. First Edition THUS. Hardcover. Very Good. Disclaimer:A copy that has been read, but remains in excellent condition. Pages are intact and are not marred by notes or highlighting, but may contain a neat previous owner name. The spine remains undamaged. At ThriftBooks, our motto is: Read More, Spend Less.First edition THUS. SIGNED by the author. Minor shelf and handling wear, overall a clean solid copy with minimal signs of use. Binding is sound. Pages are intact and free of marks. One of the most influential figures in the field of self-help, Dale Carnegie authored nearlyt a dozen books over his lifetime, with all of them becoming bestsellers. Secure packaging for safe delivery.Dust jacket quality is not guaranteed. 1993-06-07. Good. Ships with Tracking Number! INTERNATIONAL WORLDWIDE Shipping available. May not contain Access Codes or Supplements. May be ex-library. Shipping & Handling by region. Buy with confidence, excellent customer service! Lightyear Pr. Hardcover. 0899683207 New Condition. . New. www.snowballpublishing.com. PAPERBACK. 160796550X New Condition. . New. New York, N.Y.: Firest Hills Publishing Co. , 1932 Signed award bookplate on the front endpaper, signed by Dale Carnegie. Board tips lightly bumped and worn, with some board exposed. Top and bottom of spine also with some tiny tears and a small chip. Very little wear otherwise and very clean and tight. Deckled fore edge, burgundy top edge.. Hard Cover Pictorial Boards. Good +/No Jacket. 8vo - over 7¾" - 9¾" tall. New York: Perma Giants, 1949. Reprint Edition. Hardcover. as is. 305 pages. Bibliography, rear board weak, text darkened and stained, boards soiled, spine faded, bookplate signed by Dale Carnegie. Small tears and small pieces missing at top and bottom of spine, board corners worn. Appleton Century, 1938. Hardcover. Good. Garden City, New York: Dale Carnegie & Associates, 1977. An interesting account of not commonly known facts about the stove-pipe hat president. 253 pp. plus Bibliography. Green boards feature black text and the DaleCarnegie Course logo on the front board. Presentation ackowledgement (1979) on ffep signed (faux ?) by Dorothy Carnegie. Book has slightly sunned spine ends. Unclipped, unpriced DJ has sunned spine and surface scratch through course logo. Bookseller's Inventory # 091510.. Eleventh Printing. Green Cloth. Fine/Very Good. 8 3/4" X 5 3/4 ". Appleton Century, 1936. Hardcover. Signed: Very good. Inscribed by Dale Carnegie to one of his students. This a nice clean copy, the spine is solid, The text is clean and pages are not torn or dirty. We provide fast and reliable shipping service. We started to sell on the internet in 1998. We ship from California. All our books are guaranteed. The World's Work. 1947 The World's Work hardback, first edition thus, no dj; Good, lightly aged, previous owner's details on fep else clean inside; UK dealer, immediate dispatch . Good. Hardcover. 1st Edition Thus. 1947. New York: D. Appleton and Company, 1938. 305 pp. White endpapers. Green cloth with black titles. Corners bumped, light wear along the edges. Beige DJ with black titles. Small chips, light wear along the edges. VG/VG. New York, NY: Dale Carnegie & Associates. Hard Cover. Very Good  Used/Missing. Signed by members of Dale Carnegie Class 2120 (1989) and with a presentation plate in front endpaper. Very nice condition. Lightyear Pr. Hardcover. 0899683207 Like New Condition. . Fine. www.snowballpublishing.com. PAPERBACK. 160796550X Like New Condition. . Fine. Garden City: N.Y.: Dale Carnegie & Associates, Inc., 1959. Fine in Near Fine jacket 8vo-over 7Â¾"-9Â¾" tall. pp.256 with bibliography. Finding the story of Lincoln's career fascinating he decides to write about it. clean tight unread copy d/j minuscule edge and corner wear former owner name on frontpiece but a white sticker covers it.. Hard Cover. Near Fine/Near Fine. The World's Work. Used - Very Good. Great condition for a used book! Minimal wear. The World's Work (1913) Ltd., 1961. Hardcover. Good/Good. 1961. Reprint. 251 pages. Pictorial dust jacket over blue cloth with gilt lettering. Bright pages with light tanning and foxing to page edges.Presentation plate on front paste-down, with rubbing and a few small nicks to text block edges. Occasional finger marking throughout. Inscription on rear paste-down. Slight tanning along spine and board edges. Mild rub wear to surfaces and edges with crushing to spine ends and minor bumps to corners. Dust jacket has a few creases, scuffs and small tears. Light tanning. Rubbing with shelf wear. Flaps are unclipped. Dle Carnegie and Associates Inc. Hardcover. 1979 15th printing book plate paste down with Dorothy Carnegie signed 256 pages sharp corners appears unread dust jcket lightly scuffed . Very Good. 1979. Dale Carnegie and Associates, Inc., 1970. Free Front Endpaper has been torn-out, dust jacket has some rubbing/edgewear. We are professional sellers with an open shop - established '97!. Hard Cover. Acceptable/Acceptable. Dale Carnegie & Associates. Used - Acceptable. Shows definite wear, and perhaps considerable marking on inside. Forest Hills Publishing, 1932. Presentation copy award This book has been awarded by vote of class number to Alllyn A Pierson as a prize for an excellent talk on " How to Win Friends and Influence People" Congratulations Dale carnegie. small loss of laminate to the head of the spine. Signed Book Plate. Hardback. Vg/No Dw as Issued. Pictorial Boards. www.snowballpublishing.com. PAPERBACK. 160796550X Special order direct from the distributor . New. Hauppauge, New York: Dale Carneigie & Associates, Inc., 1959. Hardcover. Very Good/Very Good. 8vo - over 7¾" - 9¾" tall. Much Later Printing Than Copyright Date Indicates. Includes Bibliographical References. The Book Is Bound In Green Paper Over Boards With Red Lettering On The Front And Spine. Light Bump To The Upper Back Corner And Lower Spine Tip. The Unclipped Jacket Has Moderate Wear And A One Half Inch Tear At The Upper Front Spine Fold. One Quarter Inch Tear At The Lower Edge. Garden City, NY, USA: Dale Carnegie & Associates, Inc., 1977. Eleventh Printing. Hardcover. Very Good in Very Good, but Torn and Chipped DJ. Green hardcover cloth boards with black lettering along the spine and on the front board. Gift bookplate on the front free page. The DJ has a half-inch chip and four tears to one inch. 256 pages. NY: WW NORTON, 1938. owner's name to ffep., clean text.. FIRST EDITION. HARDCOVER. VG/VG. New York: Appleton, 1941 early reprint, lacks backstrip, top edge soiled with minor mark intruding to margin at top of first few pages, actually reasonably clean text block, there is an inscription and date stamps to fep "with kind regards from "Major "Edmundson's Batman", final flyleaf has stamp of 2NZEF ERS with Kiwi and four stars, rear hinge open showing binging, rear fep missing, Lt-Col F. B. Edmundson was in the 4th and 6th Field Ambulance, and later DDMS 2 NZEF, front paste down has ADS 214 in ink, interesting book on Lincolcn, with interesting provenance, 305pp, will need rebacking. reprint. Cloth. Fair/No Jacket. 8vo - over 7? - 9? tall. Dale Carnegie and Associates, Inc.. Hardcover. B000RBEFPS Meets or exceeds the good condition guidelines. Nice copy. Gift inscription inside cover. Five star seller - Buy with confidence! . Good. Long Island NY: Forest Hills Publishing Company, 1932. Light green hardback with black print on boards. Moisture staining/whitening to bottom area of front and back boards. Minor general shelf wear to boards. Damp stain (light browning) to outer edge of frontispiece. Light "wave" to pages. This book was stored for a long time (probably in a damp location). Other than the slight wave to the pages, I don't see any other evidence of moisture. However, the book was quite musty smelling. I have had a couple pieces of microchamber paper in the book and that has helped reduce the musty smell, but it is not totally gone. The page are tight but the book will lay open. The pages are clean/unmarked. 305 pages. Only print inifo is Copyright 1932. Illustrated. . Hardcover. Very Good/No Jacket. 8vo - over 7¾" - 9¾" tall. New York: D.Appleton-Century Company, 1943. Hardcover. 305p. A green cloth hardcover book in very good condition. Former owner's inscription on front endpaper. Edges rubbed. Otherwise clean and tight. A biography of Abraham Lincoln. Hauppauge: Dale Carnegie & Associates, 1959. Burgundy titles on light green cloth. 256pp. Presentation plate ffep.. Later Printing. Hard Cover. VG-/No Jacket. Octavo. Dale Carnegie & Associates Inc., 1959 Hard cover. 4. Very good in good dust jacket. Only one issue, rear lower board was wet, rear lower dust jacket is moisture wrinkled, minimal staining. Otherwise extremely tight and clean and very close to new condition overall. .
Garden city, NY: Dale Carnegie & Associates, Inc, 1973. very good hardcover with no dust jacket. Previous owner inscription & embossed stamp. Minor water damage.. Hardcover. Very Good/No Dust Cover. The World's Work. Hardcover. B00F2F96AI Good Condition. Five star seller - Buy with confidence! . Good.